The Schoolhouse Children's Museum & Learning Center strives to engage young children in playful discovery through hands-on, interactive, learning that integrates the arts, humanities and sciences in a historical setting. Children will embrace life long learning through the joy of discovery, ex periencing South Florida's history through two floors of hands-on, interactive exhibits. Through free weekly programs, affordable education classes including S.T.E.A.M. based classes and fun activities, children will be exposed to history, art, music, the sciences and more! The Museum is a highly interactive experience. We encourage parents, grandparents, and caregivers to join in activities and exhibitions with their children. 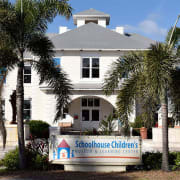 Would you recommend Schoolhouse Children's Museum & Learning Center? Had a great time. Everyone was so nice and helpful, and the little kids are so adorable and fun to work with.